The "Green Box" utilizes a standard corrugated pizza box manufactured from either 'B'flute or 'E'flute. While typical pizza boxes are currently manufactured from 60& recycled material, the "Green Box" is 100% recycled, in accordance with FDA Title 21. 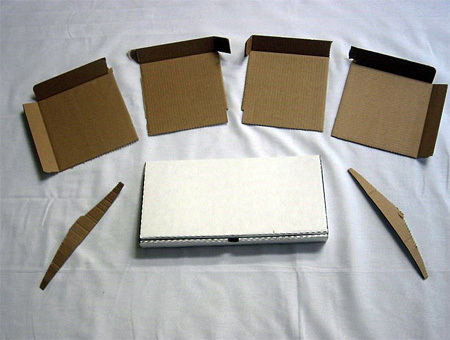 Made from a standard pizza box blank, the box requires no additional material or major redesign to manufacture. Essentially, you would be delivering a better, environmentally friendly, more functional packaging to your customers at absolutely no additional cost. The "Green Box" breaks down easily into convenient serving plates, eliminating the need for environmentally unfriendly disposable serving plates. The perforations and/or scores that create this functionality then allow for easy collapsibility and disposal.